Back Chat: The Bistro Sixteen82 Experience. Approaching Bistro Sixteen82 on a road that meanders through the vineyards of the oldest farm in the Constantia Valley, we were instantly transported from the past to the present day by the sight of a huge industrial type building with automated sliding doors. Passing through this very modern-day portal, we were met by the sight of lots of glass,wood and sleek shiny steel. A very lovely quiet, cool space. Architects, Richard Perfect and Jan Desseyn have succeeded brilliantly in creating unison between the past and the present. All the different textures blend harmoniously into a perfect whole which more than defines the sum of its parts. In order to reach the restaurant, we strolled through the Cathedral-like space of the tasting room, the 'Cellar Door'. Immediately we were transfixed by the sight of a huge brilliantly multicoloured glass chandelier. This remarkable structure that has 2,700 hand-crafted resin grapes making up the installation, took two weeks to fit it into place. It is suspended above an oval-shaped counter. 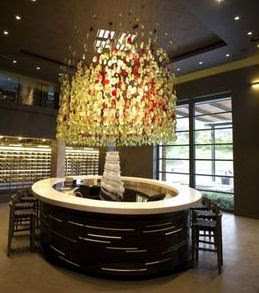 Here one can sit and have a tasting of exquisite wines and glance upwards in homage to the grape. To one side and down a few steps are comfortably and stylishly designed sofas and chairs. There is a creation of interwoven weathered vine stems that reaches towards the ceiling. A wood-burning fireplace warms one and here more tasting can be enjoyed before moving on to the delights of the Bistro. All serene and untroubled as if not to disturb the wine that is resting in the huge steel vats that can be glimpsed through ceiling-high glass panels. From here one can see chefs busily working in the kitchen and for those that enjoy charcuterie and other uncooked food, the exotic 'Raw Bar'. On our most recent visit to the Bistro on a gray and cold winter's day, we happily settled for a table indoors. White tables with woven Nguni dining chairs in the centre of the dining area, contrast with banquettes and covered chairs along the sides. We had a table in the middle near the windows where one could enjoy the pleasures of the Bistro interior and glance out at an angry Cape day. On a fine day, one can sit outdoors on a terraced dining area. The splendid gardens designed by landscaper Dirk Vervaeke, incorporate rim flow reflection pools, sweeping green lawns and masses of indigenous and aromatic plants. 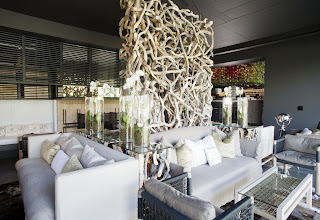 The owner of this grand estate, Graham Beck, has a collection of more than 20 metal sculptures by Edoardo Villa, some of which are positioned in the gardens of the Steenberg Wine Estate. One can see three of these brilliantly coloured metal works from the terrace of the restaurant. Just beyond, over a gentle incline, is a view that causes one to stop and stare. A sweeping vista of vineyards nestling at the foot of the Steenberg Mountain holds sway over the majestic Constantia Valley and in the distance, False Bay. The menu at the Bistro changes seasonally and is also affected by whatever is fresh and exciting at the market on the day. 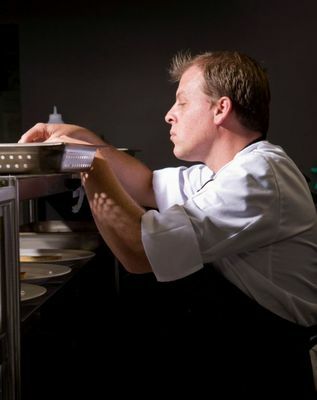 Executive Chef, Brad Ball, presides over the kitchen. This hugely energetic and talented young man has earned his stripes in kitchens all over the world. With Rowley Leigh at Kensington Place in Notting Hill in London and in kitchens in Tuscany and France, he has learned from the best. Passionate about food and with enormous enthusiasm and a big dollop of perfectionism, the food that emerges from his kitchens is superb. He is very ably assisted by his Head Chef, Brendon November. They have worked together before and well understand the concept of synchronicity. 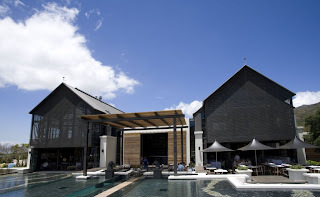 We were offered the drinks menus and I ordered a glass of Steenberg 1682 Chardonnay MCC Brut. This is without doubt my favourite brand of local bubbles and has been since first I sipped this tantalizing brew. Eugene ordered a bottle of Peroni beer. 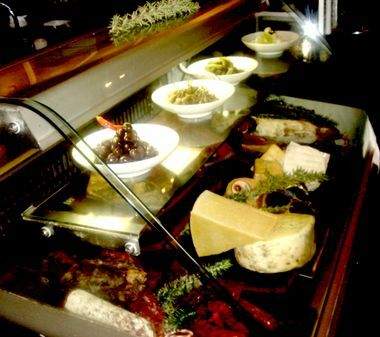 We settled down to peruse the menu and to enjoy the offering of delicious home-made focaccio which was served on a wooden board with olive oil and balsamic vinegar and little pots of olives and cubes of cheese and sun-dried tomatoes. The starters are listed on the menu under the moniker, Stimulate, and just reading them stimulated the palate. I ordered Mussels and Chorizo Crème, described as Blue Bay mussels steamed in chorizo crème and Eugene ordered Onion and Whisky Soup. We had a charming and knowledgeable waitress who seemed to anticipate our every need. The service is friendly, efficient and well-informed. We are all sick to death of dour and unhelpful restaurant personnel. My starter was a joy. 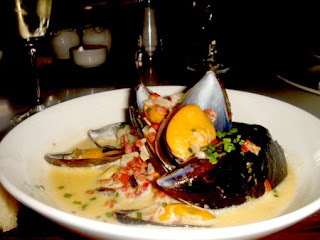 Lovely plump mussels in the half-shell in a delicious creamy soup. I scooped the mussels out of the shells and mopped up every last vestige of the sauce. Eugene's soup was rich and flavourful. There are many starters to tempt one; Butternut Risotto described as caramelised butternut with pine nuts and sage beure noisette, fresh Luderitz Oysters with shallot vinegar, hand chopped Beef Tartar or you might try Sautèed Duck Livers with a Bordelaise Crème and much more. But now it was time to move on to our main courses. Eugene ordered his main course from an interesting in-between section, 'Rejuvenate'. His choice was Poached Hens egg and Baked Crottin on potato rosti with smoked trout. Oh yum! From the main course section, Inspire, I chose a Mushroom and Leek Feullette with a melange of winter vegetables. By this time I was well onto my second glass of bubbles and Eugene had ordered a carafe of Steenberg Sauvignon Blanc 2009. The Steenberg wines are all served by the carafe or sold by the bottle, whilst other wines from the Constantia Valley are available only by the bottle. The restaurant was abuzz with chatter and laughter and we enjoyed a break between courses sipping our drinks and watching the people around us. Waiters and waitresses wove expertly between the tables, busily serving plates of exciting looking food. Our food was delicious! My tart, made from puff pastry and overflowing with Du noon mushrooms and leeks, just melted in the mouth. The winter vegetables, served al dente of course, were florets of broccoli, baby carrots with their tops on, halved baby rosa tomatoes and a garnish of watercress. All scrunchy, all delicious. Eugene's main course looked beautiful. 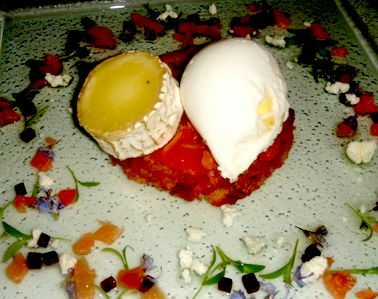 Served on a glass platter, a plump poached egg and a baked Crottin perched triumphantly atop a crisp potato rosti and slices of smoked trout. Surrounding this was a delicate, edible arrangement of flowers and more crumbles of goat's cheese. A feast for all the senses. There is a delightful selection of desserts. From the section under the aptly named title, Indulge, one can try Lemon Meringue Profiteroles or Brioche and Butter Pudding. You may choose the Baked Felchin Chocolate Tart or have a platter of Cheese For One. The Star Anise Malva Pudding with Anise infused caramel and tonka bean crème anglaise sounds perfect. There is a selection of different coffees, teas and infusions as well as hot chocolate with which to round off your meal. But things don't end there. From 4-30pm - 7-30pm each day, Tapas is served. A fascinating selection of antipasti, Chorizo Sausage, Grilled Sardines, Bravas Potatoes, West Coast Oysters, Beef Tartar and on and on. The choices of the day are written on a blackboard which is brought to your table. What a great idea to have sun-downers enjoyed with tasty food and excellent wines. Bistro Sixteen82 also serves breakfast from 9h00 - 11h00. 'Awaken The Senses' with a Bistro version of Bacon and Eggs, home- smoked pork belly bacon and scrambled eggs on toasted ciabatta with vine tomatoes, or Eggs Benedict with home-smoked pork belly bacon on potato rosti with poached eggs and hollandaise sauce, or Eggs Royale with smoked Franschhoek trout on potato rosti with poached eggs and hollandaise sauce. And much much more. I love the way Brad Ball arranges his menus with his own twist on familiar themes and old favourites. The table bread at breakfast is homemade brioche soaked in honey and butter. Beat that! Many patrons arrive early for breakfast, go off for a day of golf on the nearby golf course and then return in the evening for tapas. Now, that is what I call living! Bistro Sixteen82 is on the Steenberg Wine Estate, Steenberg. Visit the website for a map of directions or inquire when you make a reservation. Eugene and I love eating out and we always pay for our meal whenever and wherever we go.